I think the dominant feature of August was rising interbank “dollar” rates; everything that followed out in the open was traced to “whatever” was taking place in funding markets. Repo rates shot upward, as did unsecured LIBOR (leading to serious credit risk implications via TED). 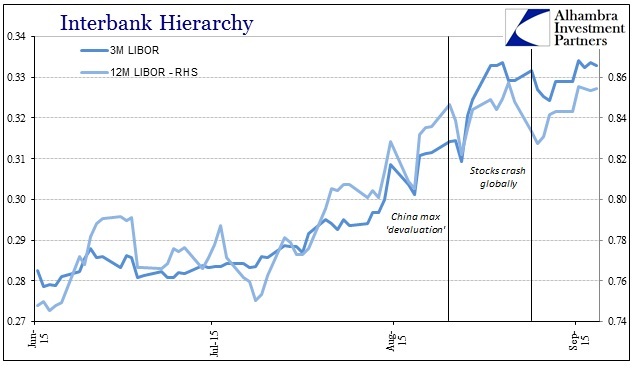 All that led into the yuan crisis escalating beyond the PBOC’s rather limited control (which is what “devaluation” really was), a serious credit rout in junk and even the crash in global stocks on August 24. The problem for most is figuring out that “whatever” part. In more immediate terms, volatility is its own enemy for as much as that might mean. It is staple of asset price reversals that any potential for decline, driven by negative perceptions, will be self-reinforcing; a bank that suddenly is perceived risky will experience funding problems and then it truly is. 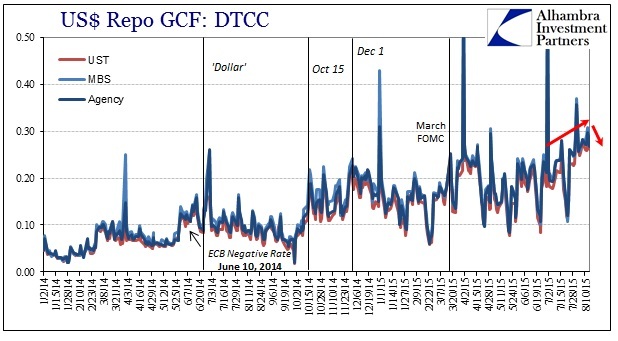 In other words, there is a chicken and egg aspect to the immediacy of the “dollar” in the past few months – was asset price volatility, especially surrounding China and Brazil, causing a manic “dollar environment or was an angry “dollar” responsible for volatility? The investment bank’s securities and derivatives trading businesses can’t continue to soak up capital, Cryan said in a letter to employees on Wednesday, his first day on the job. There are two pieces fundamental to the “dollar” in this one, short quoted passage. The first is that Deutsche is admitting that its “securities and derivatives businesses” are the central focus of the bank’s restructuring; FICC and all that. 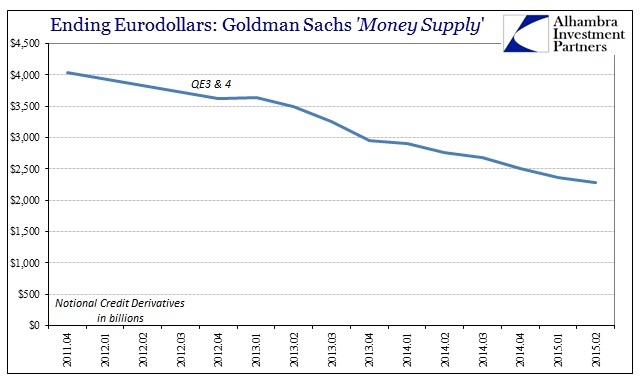 In this context, “securities and derivatives” are the eurodollar! Second, Cryan is merely pointing out that “the market” has already moved in that direction. August was merely the results of that. Because of the esoteric nature of the eurodollar standard and even how it functions within the specific operations of specific banks, this all sounds like a benign re-alignment of internal resources that any bank, or any business, for that matter, would engage in some non-specific rough spot. Viewed that way, this all seems very much unrelated and maybe only loosely tangential to funding and “dollars”; quite remote from the beguiling financial trap the Chinese find themselves within. Yet, this is the very essence of what is transpiring, and in that spirit the only factor that truly matters. 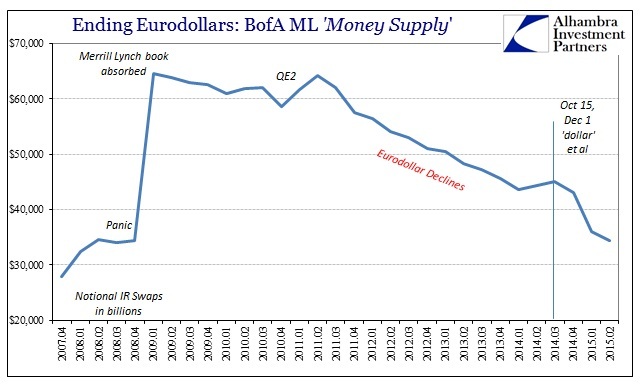 Individual banks may be looking to a new business model, but that itself is just the business end of the eurodollar degeneration. On the same day Cryan was dispensing his memo at Deutsche, the new CEO of Credit Suisse, Tidjane Thiam, was already doing the same. The Swiss banks, as I have highlighted repeatedly, make up a significant part of the European-based forms of the eurodollar complex. Here, too, the Swiss are in retrenchment mode where “investment banking” is the chief infection. Investors are optimistic that Thiam, 52, will successfully switch Credit Suisse’s focus to lucrative Asian wealth management and shrink its cash-intensive investment bank. Many also expect him to tap the market for cash and Thiam told staff in a memo that the bank needs to be able to generate its own capital and a strong capital base.  “We will need a strong balance sheet that allows us to withstand adversity, while continuing to invest in the future,” Thiam said in the memo that was seen by Reuters. That passage counts for true irony in that Credit Suisse intends to undercut the “dollar” in its shrunken “investment bank” while shifting to “lucrative Asian wealth management” that is far less lucrative because the bank (and the “market”) is moving away from the balance sheet measures necessary to maintain “dollar” order. The reductions at Credit Suisse have been staggering this year, even in Q2 before Thiam took over (as noted before on the subject of Swiss “dollar” supply, CS is well behind UBS in paring back eurodollar ingredients and is catching up; the funding market globally seems to have noticed). Updating its balance sheet for Q2, we find CS’s IR swap notionals down to 34 trillion (CHF) from 39 trillion at the end of Q1; CDS and credit derivatives to just 1.1 trillion (CHF) and even forex derivatives cut to 3.8 trillion (CHF) from 4.3 trillion. Since the end of Q3 2014 (just prior to October 15, December 1 and all that would lead the SNB to break the euro peg to save its “dollar” banks), total notional derivatives have collapsed by 28% at Credit Suisse! I haven’t made a full study of the Swiss impact during 2008, but my gut sense and what research I have done so far leads me to believe that the huge reduction in Swiss “dollar” mechanics in 2008 was outsized in the proportional contribution to the overall panicked environment. Here, in at least one of the Swiss banks, we see something similar again into the hot “dollar” summer so far. 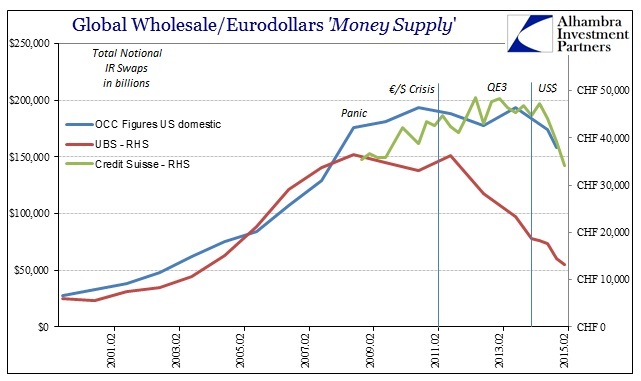 If nothing else, it reinforces the wholesale notion of January 15 and why the SNB acted as it did; and thus why that was, as August 11 when the PBOC broke, an important waypoint in the declining eurodollar trajectory. While we await the OCC to update its domestic derivative count for Q2, we can observe similar declines in trend if not magnitude continuing among the biggest US dealers (there are only four that really matter). 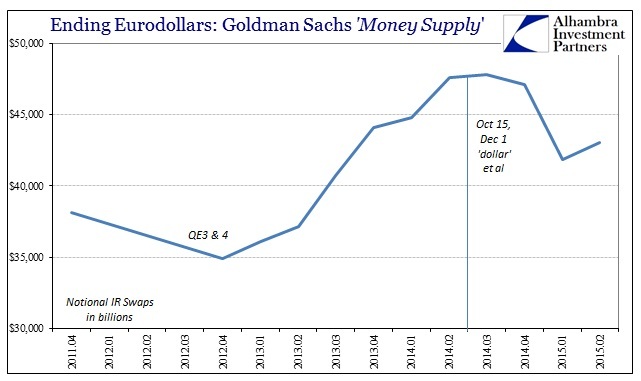 While IR swaps at Goldman Sachs were up in Q2 over Q1 (in between the “dollar” waves) they are still more than 10% below last year’s peak “dollar”; that is particularly significant, I believe, since Goldman was a unique outlier in adding to its IR swap portfolio since QE3 against the “market” tide. Currency and credit derivatives declined. At Bank of America, Merrill Lynch’s IR swap notionals dropped another $1.7 trillion, to $34.4 trillion gross. That compares to $45 trillion just prior to October 15 and $62 trillion during the 2011 “dollar” flare up; ML’s balance sheet in IR’s is half what it was only four years ago. On the credit side, gross exposure is about one-third the balance when ML “failed” into Bank of America’s cold fusion. 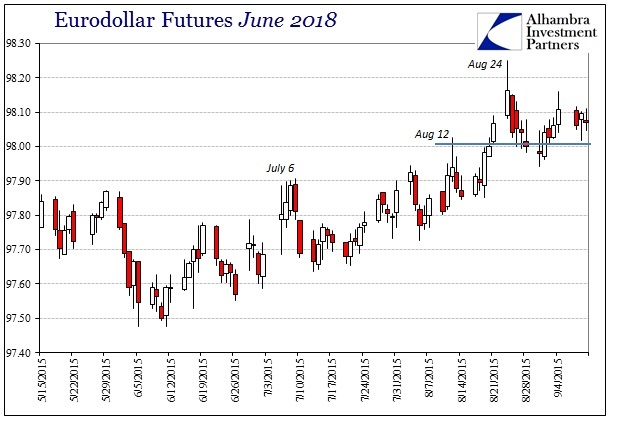 Under these conditions, especially the Swiss end of the eurodollar, there should not have been much surprise as to how globally destabilizing the “dollar” had become by early July. The outward appearance of repo and LIBOR were telling us about these internals reaching a volatile critical point. 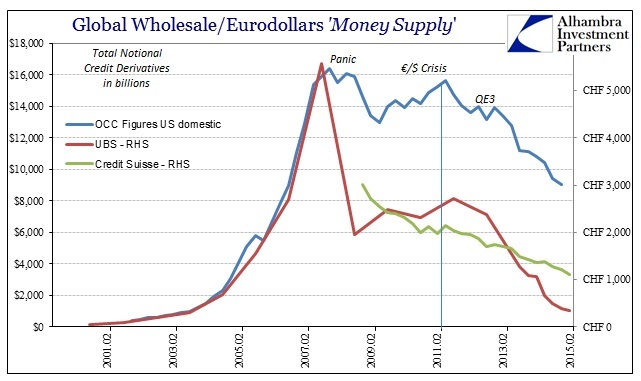 It isn’t necessarily a given that unwinding a massive monetary structure as complex, opaque and downright byzantine as what passes for the “dollar” is going to lead to chaos and near-panic (to this point) but the chances of an orderly withdrawal aren’t much more than trivial either. The former might lead to some outpouring of hope and optimism but the reality is both far less assuring and almost surely the base case. When you see, as today, that major global banks are restructuring and laying off employees by the tens of thousands, that is synonymous with this eurodollar retreat. 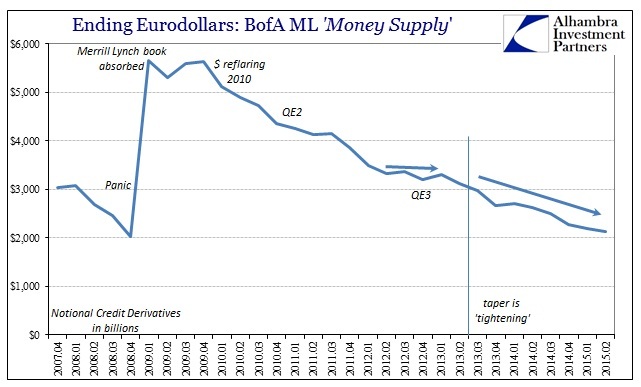 Whether this structural “dollar” problem is causing the economic decay or whether it is growing global recession (and all the crisis points that, instead of regulatory changes, mark the decline) that is leading banks to flee isn’t really a consideration. In the end, both are reinforcing of each other and are thus, in my view, both the same reversion being expressed through different means. The world (financialized economy and markets) that was built up to August 2007 was simply unsustainable and could not go on any further; that counts for both the global economy that took in the marginal artificial influence (esp. China) and the “dollar” system that connected it all.